We realize that neurofeedback can be confusing at first, but we’re here to answer any questions you may have. Below are some frequently asked questions we receive about BrainCore. Your first exam will be testing only; no treatment will be performed. First, you and the clinician will determine if you are a candidate for BrainCore. If we believe you will benefit from the BrainCore program you will be taken to the BrainCore suite to complete your brain map. From there, we will schedule an additional appointment with Dr. Batson to go over your results. A brain map can also be called a QEEG—quantitative electroencephalogram. Using 14 electrodes attached to a cap, we will read your brain’s electrical activity. A QEEG will not transmit electricity, only gather electrical input. The brain map is simple and painless. The clinician will slip the QEEG cap onto your head and fill the electrodes with a transmitting gel. We will then take 6 readings at 1-minute intervals. Your task will be to remain still with your eyes closed, then repeating the procedure with your eyes open. What is the difference between Neurofeedback and EMDR (Eye Movement Desensitization and Reprocessing Therapy)? EMDR uses specific eye movements to help patients try to process traumas. QEEG Neurofeedback takes a look at the patients’ brain waves and helps to establish healthy brain patterns. When scheduling your initial visit, it is best to leave an email address. We can then email you your new patient packet, which you can fill out and bring to your first appointment. If you are not able to bring in your new patient packet, please arrive 15 to 20 minutes early to complete it. This will allow the appointment to run as smoothly as possible. How should I dress for my first appointment? There is no specific dress code for a brain mapping session, but you may want to dress comfortably. We ask that your hair be clean and free from any conditioners or hairsprays the day of your testing. Styling gels and hair oils should also be avoided. Earrings will need to be removed before testing begins. When will I begin training? After your initial exam and discussing your results with Dr. Batson, you may begin treatment immediately. We offer flexible hours to accommodate those who may work late. What happens during a training session? This is one of the most frequently asked questions we get. A BrainCore training session begins with a relaxation exercise to get your brain in the right place to learn. Oxygen therapy will also be provided to allow your brain to work at its highest capacity. From there, the clinician will place two electrodes at the sites specific to your brain map. Then, you will play a game like Pac Man, or work a puzzle. Pac Man will only move—or a puzzle piece will only appear—when your brain is producing the waves we want. Gradually, your brain will learn to function better in order to complete its task, all while you relax! We also use DVDs to train. The screen will only stay bright when you are hitting the goals we have set. Your brain will work hard to keep the screen bright, while you relax and enjoy the show. Best results are achieved by training 3 times per week. BrainCore is meant to be tailored to your schedule! You may come as little as once a week, but your progress will be slower. How long is a BrainCore treatment plan? An average treatment plan lasts for 3 months. You can come as often as you would like during that time. Again, the best results are seen with a consistent training regimen of 3 sessions per week. Do I have to wait a day between sessions? No! BrainCore sessions can be completed back-to-back. This allows for a more flexible schedule for our patients. The length of time required to see results will vary from person to person. We have seen positive changes in as little as 1 visit! No! The best part about BrainCore is that nothing is done to the patient. 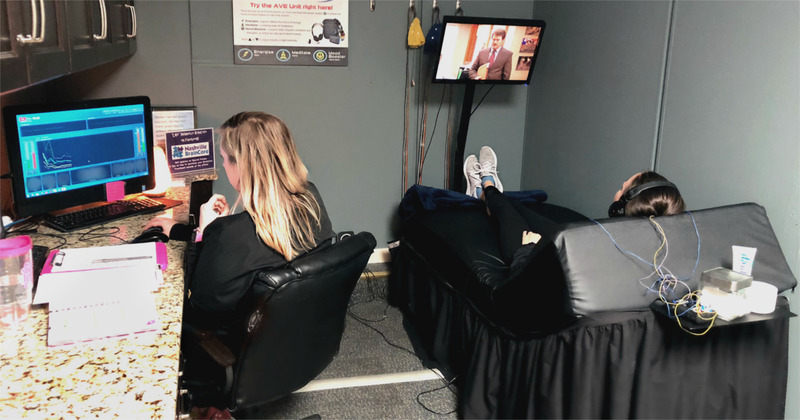 Your brain simply responds to real-time EEG feedback while you relax and play games. Yes! Once we teach your brain to function more efficiently, it will want to stay that way. Research has shown lasting effects from neurofeedback for up to 30 or 40 years! These are only the most frequently asked questions. Have any other questions for us? Give us a call at (615) 823-8995 or send a message!